Please send cheques to 41 Queen's Gardens, London W2 3AA payable to Red Violin Limited. 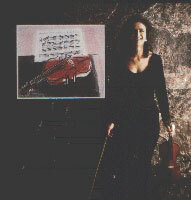 The Red Violin is seeking sponsorship and is a member of Arts & Business Wales. There are lots of opportunities for advertising in the brochure (print run 12,000) which comes out 6 weeks prior, posters and banners.